As predicted in my earlier post, China anti-market pricing policy is running into crisis. 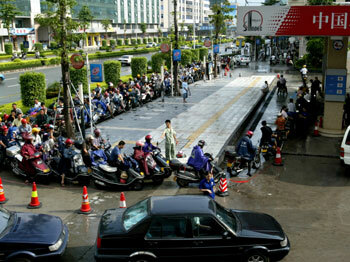 Gas stations in Guangdong refuse to sell and Sinopec/CNPC are not supplying the retail stations. Long lines make fueling wait into hour-long ordeal, or sold out when you reach the pump. Even People's Daily is admitting it now. WSJ also run a good report on "China's Fuel Shortages Add to Pressure to End Central Planning". 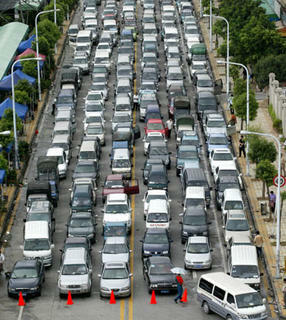 The phenomenon in Guangdong showed that the oil oligarchs, although state owned, are rebelling by hoarding the gasoline. This is good evidence to rebuff China bashers in the CNOOC/Unocal incidence. Yes, the GM is indirectly appointed by the government, but P&L is definitely becoming a higher priority. This will likely set precedence as one of the crucial baby steps for the SOEs (state owned enterprises) to break free from state control. The better and easiest option is, of cource, to let RMB appreciate a bit more (thanks Brad for reminding me the obvious). There are pros and cons, the oil price has risen by a percentage much larger than any feasible RMB appreciation could counter, but by feeding all numbers into a formula, there must be a solution as to what is the best percentage RMB should appreciate vs subsidy needed. (Even if one includes the macro-GDP growth target in the calculation) Still this doesn't solve the artificial price issue. updates: FT said Oil in many Asian countries are subsidized, it noted "China, the second biggest oil user after the US, is one of the offenders. Retail prices of most fuels are controlled and the domestic refined oil price has risen only 15 per cent this year, against 30 per cent for crude oil." Well, yes, China's oil price is not following international market price. But one has to note that price at the pump should always rise slower than crude. Because the cost include that of refining, additives (basically the difference between PON 87 and 93, or RON 90-95), and operating (transportation, rent, labor). That is true also in the US, although it maybe 20% instead of 15%. and China Daily is bolder than People's Daily, saying, "it is time for pricing reform!" "We don't know if the Chinese have suddenly appointed Jimmy Carter as their energy czar, or whether it just seems that way. The two- and three-hour long gas lines now stretching down city blocks in many provinces in China are certainly an unwelcome reminder of the 1970s when U.S. policies caused a similar energy panic. So let's think of this as a teaching moment. In China today, many of the same Carter-era policy prescriptions for high energy prices have incited the unprecedented gas lines. The government has imposed price controls on oil and gas in an effort to fight inflation, just as the U.S. did back then, and in the last few weeks it has even resurrected another Carter-era gem, a "windfall petroleum profits tax" on oil and gas producers. Perhaps Chinese President Hu Jintao will soon deliver a televised speech to the nation wearing a cardigan. By holding domestic prices to about $10 a barrel below the world price, according to the International Energy Agency, Chinese oil firms have discovered they can make more money selling energy abroad than at home, thus lengthening the gas lines. Gasoline shortages in recent days have become so severe that Hong Kong's South China Morning Post reports that the waiting lines have infuriated "everyone from taxi drivers to farmers across the country, and could threaten social stability." Two other Asian nations, Indonesia and the Philippines, have also been toying with oil price controls and gasoline rationing -- so they might want to watch and learn from the Chinese mistake. Price controls that are set below the market price always exacerbate shortages, because the artificially low price causes demand to rise and supply to fall. With the price no longer permitted to equilibrate supply and demand, consumers wind up paying not with dollars, but worse, through waiting lines and lost hours in the day. That's what beleaguered Russians learned many times over when they waited in grocery lines for price-controlled bread and chicken and chocolates during the Soviet era. And it is what enraged Americans learned when parked in gas service station lines at 7 a.m. during the 1970s, which, since it included both the Nixon and Carter years, was arguably the worst period for U.S. economic policy during the last century, Herbert Hoover excluded. A windfall profits tax only discourages increases in supply by disincentivizing further production. High profits are precisely the desirable signal that a market sends to firms to find and produce more oil and gas. The good news for the Chinese is that they can look to history for a way out. When Ronald Reagan became President in 1981, two of his first official acts were to immediately repeal all Carter-era oil and gas price controls and to repeal the oil windfall profits tax. Oil prices soon rose to their natural market level, and through the invisible hand of the market, production rose, consumption fell and prices began a steady decade-long decline. The U.S. energy "crisis" was over." 4. establish crisis control mechanism"
I can't imagine DRC would have thought 2-4 are solutions. My impression was these are smart people. Price increase is the best incentive to steer the public toward energy efficient options. More follow-up by Scott at AMCGltd.com, "Oriental Oil Imbroglio "
can you believe this? Hawaii is following the China model , expect some hoarding and lines in gas stations.